An accounting software end user today experienced the message "This file is currently not available for use on this computer" when trying to click on existing icons on two client PC's trying to launch tp7runtime.exe via a previously established network share and both using UNC paths. The software in the installed ("gateway") PC in this workgroup still worked as expected. The user had not made any changes other than to install an Adobe Flash Player update on one of the two client PC's. No doubt however these PC's received recent Microsoft (and last week was a bad week for those that led to numerous problems, more than usual) and anti-virus updates (which can suddenly change settings, block ports, etc.). All three of the PC's were Windows 7 Professional. The network had already been established as a "public network" and naturally everything had been working without any problem until this morning. The user had already tried re-booting the PC's on the network to see if that would resolve the problem. It did not. Remotely viewing one of the client PC's that could not load the software as well as the gateway PC, we noticed that the icon that launches the software that in this situation had been previously set to "Run as administrator" now had that check box grayed out. And in trying for troubleshooting purposes to setup a new icon, Windows returned the same "file is currently not available for use" message. In navigating the available computers to set that icon, it showed the gateway PC's computer name twice which was very odd. We did make sure that the UAC was not getting in the way. A net view of the gateway PC that had also been mapped as a drive letter for some reason indicated something interesting in the comments: [Offline share]. In trying to delete the drive map, Windows responded that files were in use but viewing the gateway PC where that drive was mapped, in fact there were no open files in the shared folder. We made some minor changes to some of the network settings on both PC's, and tried to stop and start various network services on the gateway PC; the issue remained. While the sharing and file privileges all appeared to be correct on the gateway PC, we decided to stop sharing the folder and then re-share it after first disconnecting from the offline share (after also turning off the option to share files offline which seemed to have no effect). That was completed and we re-added "Everyone" with read/write privileges. In doing this, Norton Internet Security installed on the gateway PC came up with a prompt indicating that because it was a public network, certain Windows services were blocked. We decided to go ahead and allow Network Discovery, File and Printer Sharing and Remote Procedure Call and Remote Procedure Call (and so they were added to the NIS exception list) which seemed logical in that it had already been established as a public network. Re-testing, the client PC's were then able to once again launch the tp7runtime.exe application. There have been other reports of this issue that have involved very different solutions. 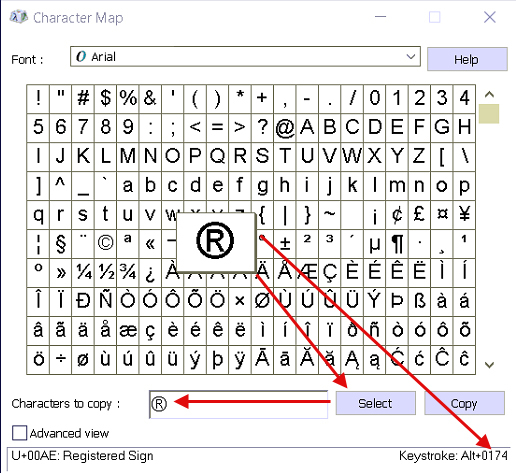 Recently an accounting software user asked us how to insert special characters or symbols such as the copyright and trademark related symbols into data entry fields such as inventory descriptions. In Windows-based systems (including Advanced Accounting), there are several ways do to this. Let go of the ALT key. You could also enter a special symbol into the message line or a sales order or purchase order or into any word-wrapped note (memo field) in the system. But how do you determine what the code is for the desired symbol or character? 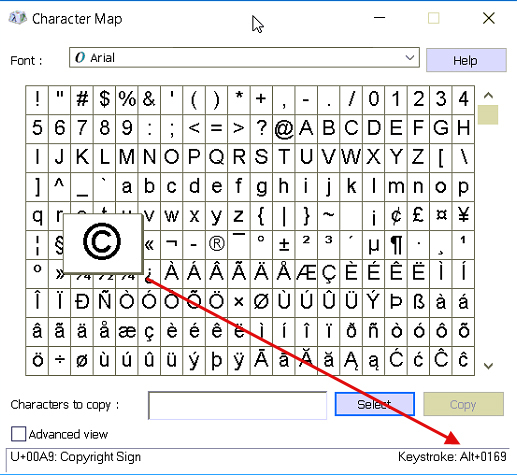 There are on-line lists and other references for these codes, but the simplest way perhaps is to lookup the code using the Character Map option provided in all Windows operating systems. So in the example above, clicking on the copyright symbol provides the ALT code for that symbol. For more or less any source you and also copy/paste in characters. After clicking on the desired character or symbol then click on Select and then Copy and the character is available to be pasted (CTRL-V) into the desired data input field. Regardless of the font chosen, the font will be 'converted' to the font that has been specified for that entry object on the underlying Windows data entry form. So the font will not necessarily be rendered in the same font as the source from which it was copied. In Advanced Accounting, the default font is Arial and that is the font therefore that the special character or object would be rendered in after pasting it into the desired field. Word processing programs typically have similar options from which special character or symbols can be copied and then pasted. TTASENTER, TTASComboEnter, TASMemo, TMemo, TListBox and TTASDataGrid cells that are string-based. Further, the direct data input (ALT) method will even work with label and button captions and data grid headers in the Screen editor (as well as with label captions and objects linked to data or that have TStrings properties in the Report designer) should you need to use a special character or symbol as a caption or header.